PORTLAND, Ore. (CN) – A photographer who took a photo of pre-superstar Michael Jordan for Life magazine, in midair soaring toward the hoop, could not persuade the Ninth Circuit that Nike ripped him off with its “Jumpman” logo. While the panel concluded it was plausible that Nike copied the photo, photographer Jacobus Rentmeester could claim copyright only to his creative choices, such as camera angle and lighting. The midair pose itself is not entitled to copyright protection, the panel held on Tuesday. Rentmeester sued Nike in 2015, claiming it infringed on a photo he took of Jordan for a Life magazine feature on the 1984 Summer Olympics. At issue are an alleged reproduction of the photo, and the silhouetted “Jumpman” logo used in Nike advertising. Rentmeester, an Olympic rower from the Netherlands, moved to the United States in the 1960s and started a career as a photojournalist. His work, featured on several Life magazine covers, includes images of the hostage crisis during the 1972 Munich Olympics and swimmer Mark Spitz. His complaint against Nike involves a photo he took of a young Michael Jordan, then a student at the University of North Carolina, as part of a photo essay for the 1984 Summer Olympics in Los Angeles. Before the Ninth Circuit last July, the photographer’s attorney argued that in arranging the elements of the photo as Rentmeester did, the photo was an artistic expression entitled to “at least” standard copyright protection. Rentmeester arranged the photo in a way that would “trick the viewer into thinking that Mr. Jordan was performing a gravity-defying dunk,” according to a brief to the court. At the hearing last summer in Portland, Ninth Circuit Judge Paul Watford hinted at how he would rule when he expressed skepticism about whether Rentmeester could copyright a pose. On Tuesday, the panel affirmed dismissal. While Rentmeester plausibly alleged he had a valid copyright for the photo and that Nike may have copied it, he “cannot copyright the pose itself and thereby prevent others from photographing a person in the same pose,” Watford wrote for the panel. “He is entitled to protection only for the way the pose is expressed in his photograph, a product of not just the pose but also the camera angle, timing, and shutter speed Rentmeester chose,” Watford wrote. But the panel rejected Nike’s argument that all photos are entitled only to “thin” copyright protection, noting that Rentmeester had a broad range of creative choices in taking the photo he did. 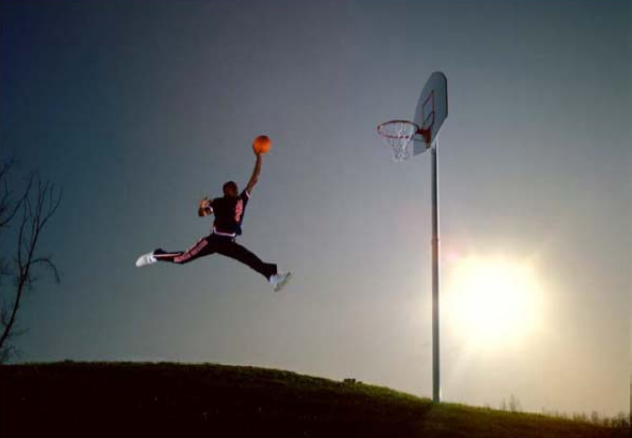 But even so, the image was not “substantially similar” to the Nike photo that led to the Jumpman logo, Watford concluded. “Nike’s photographer made choices regarding selection and arrangement that produced an image unmistakably different from Rentmeester’s photo in material details — disparities that no ordinary observer of the two works would be disposed to overlook,” the judge wrote. Ninth Circuit Judge Marsha Berzon concurred. Ninth Circuit Judge John Owens wrote a partial dissent, saying some issues should be decided by a jury. “(Q)uestions of substantial similarity are inherently factual, and should not have been made at this stage of the game,” Owens wrote in dissent. Attorneys for Rentmeester did not immediately respond to requests for comment.